6-in-one prep tool. Prepare and garnish flowers, baskets, stars, peel fruits and vegetables, unique no-mess citrus peeling action, ergonomic handle, finest German surgical grade stainless steel blade. Includes snap-on grater. BÖRNER of Germany, manufactures the finest quality vegetable slicers on the market today and are leading edge in design and technology. Their unique products help add creativity to any gourmet meal. 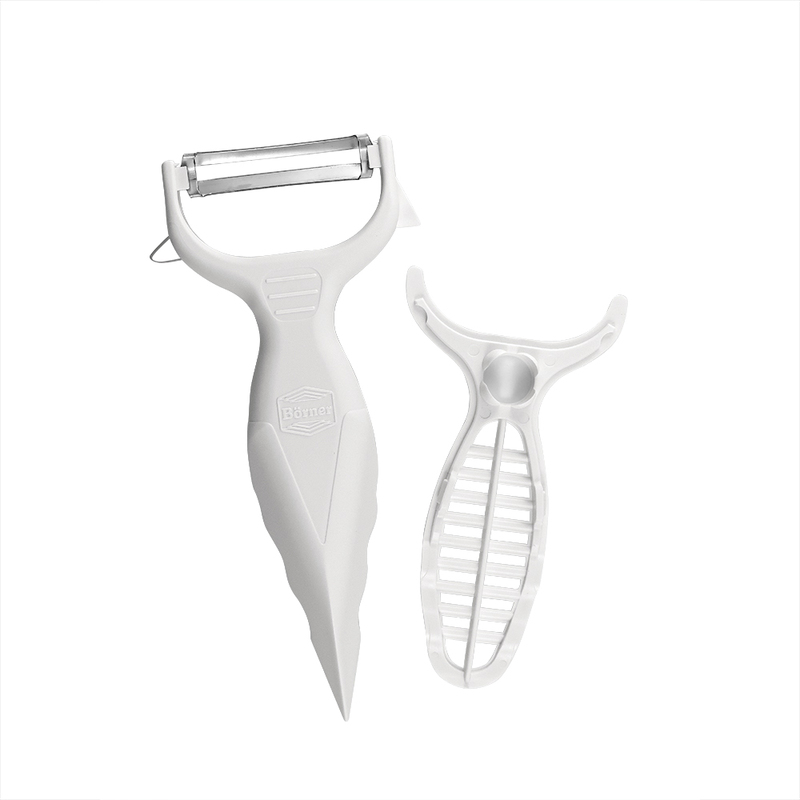 In addition to peeling fruits and vegetables, this 6 in 1 prep tool can assist in preparing creative flowered garnishes, offers unique no-mess citrus peeling action and includes a snap-on grater for garlic or nutmeg. The multi-peeler blade is made of German surgical grade stainless steel. In 1956 Börner manufactured an onion cutter made of a piece of wood with four blades. Today the Börner products have evolved into a must have line of slicers from the V-Slicer Pro to the Combi-Chef and Veg' Art Prep Tool. Börner products help add creativity to any gourmet meal. All Börner products are made in Germany.